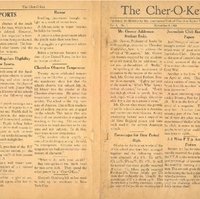 Cher-O-Key, the bimonthly school newspaper published by the Journalism Club of Cherokee Junior High School, which was located at 550 South Eola Drive in Orlando, Florida when it opened in 1927. The Volume I, Number 1 edition was published on November 9, 1928 and cost one cent. Articles in the newspaper include Professor Grover of Rollins College's address to Cherokee Junior High, grade percentages, the activities of the Journalism Club, the Parent-Teacher Assocation, a calendar of events, merit cards issues to students, Roberta Barnett's essay for the Florida State Dental Assocatin, social activities at the scool, a ruling by the Board of Education, new rules for eligibility for sports, and the temperance movement. Original school newspaper by Ruth Wetherington, ed: The Cher-O-Key Vol. I No. 1. November 9, 1928. Private Collection of Thomas Cook. Digital reproduction of original school newspaper by Ruth Wetherington, ed: The Cher-O-Key Vol. I No. 1. November 9, 1928. Copyright to this resource is held by Cherokee Junior High School and is provided here by RICHES of Central Florida for educational purposes only. Published Bi-Monthly by the Journalism Club of Cherokee Junior High School. Mr. Grover Addresses Student Body. Mr. Grover, Professor of books at Rollins college, returned to Cherokee Wednesday, Nov. 7, to address the subject of "Education." Mr. Grover was warmly received by the students as an old friend, for he addressed us last year on the subject of "Books." In speaking of the importance of education to the success of the individual, Mr. Grover cited Herbert Hoo¬ver as an example. "Eighty per cent of the names in "Who's Who" have a college education," he said. "Every day in high school is worth $25 to each pupil, while a college education adds $55 a day to a person's value." Mr. Grover then traced the growth of public school education in America, and pointed out its tendencies. A very interesting feature was a copy of an old New England primer and horn book used in the earliest American schools. Percentages for First Period High. Jean Pettay, of section 9-2, recently brought several old papers to school which were of great interest to the Journalism Club. One was published at the time of Lincoln's death and gave a vivid account of the assassination. This edition also contains news of the Civil War. Another is the New York Herald for April 25, 1856. This issue contains a variety of news, ranging from "most horrible murders" to "great balloon ascensions." A most interesting copy is the Saturday Evening Post for June 16, 18¬28. It is in the form of a paper instead of a magazine. The print is very fine. A rather interesting and amusing part of the Post is a collection of very dry jokes relating to the experiences of theEarl of Marlborough. In 1828, it seems to take two paragraphs to tell what could be told in two lines in 1928. Section 7-I has for two consecutive months received the picture offered by the P T A to the section having the largest percentage of parents present at the monthly meeting of this organization. The seventh grade this year seems to be taking the lead in nearly all of our school activities. We wonder if the eight and ninth grades are going to accept the challenge offered by Cherokee's newest class? The editorial staff of the Cher-O-Key salutes the student body. We since the opening of school. Billy greet you confidently- confident that our undertaking will meet with your approval and confident that you give us your hearty support. We offer no, apologies for beginning on a small scale, for we believe that our modest beginning of today will culminate in a tomorrow full of glorious achievements on the part of Cherokee’s journalist. In compiling this and future editions, the staff has but one object in mind- to give wholesome publicity to Cherokee. To accomplish this objective, to give her the most complete and adequate publicity, we solicit the aid of the entire student body. We urge a continuance of your reputed spirit of co-operation. Boost your paper, boost your school, and let us all strive to make Cherokee’s newest enterprise a complete and notable success. The staff of the Cher-O-Key wish to take this method of thanking the printing department and typing club for their splendid co-operation in making our journalistic venture possible. While the paper largely represents the efforts of the journalism club we wish the student body to know the share that these two departments are taking in our publication. We sincerely appreciate their support and willing aid. Monday, Nov. 12: Armistice day. Holiday. Wednesday, Nov. 14: Auditorium program sponsored by section 7-7. Wednesday, Nov. 21: Auditorium program with section 7-2 in charge. Merit cards have rivaled the Wall Street stock markets in fluctuation since the opening of school. Billy Tyree was the first student at Cherokee to receive a merit card this year. A week later, Ruth Wetherington received the second. Since that time, the awards have been steadily increasing in numbers. These cards are given weekly to some students who have attained a high excellence in scholarship. The following students have received merit cards during the week of Oct. 15-19: Dorothy Cuthberson, Mary Terhune, Ormond Powers (2), Billy Berst. Week of Oct. 22-26: Barbara Parker, Esther Hadeck (2). Helen Arendt, Roberta Barnett, Virginia Copeland, Effie Mc Gormack (2), Clifford Haughton, Billy Tyree, Irvin Marchand, Edna Parker, Newelle Clark, Howard Davis, Winifred Berst, Sara Harell, Harriet Ravencroft, Cecil Keith, Edna Hinchey, Maxine Fugate, Shan Kazarosian. On Wednesday, Oct. 31, there was an unusual situation; there were no merit cards for the preceding week. Last week the Florida State Dental Association offered a prize of five dollars and a second prize of two dollars and a half to the ninth graders who were able to write the best compositions on the subject, "The Teeth in Relation to General Health." In Cherokee, the ninth grade students wrote their compositions under the direction of Mrs. Benton and Miss Mitchell, the English teachers. Roberta Barnett, of section 9-2, wrote the composition which was chosen to represent Cherokee; it was sent to the contest headquarters at Miami. Due to the fact that Harold Hughston captain of the sergeants, has moved from Orlando, it was necessary for the council to eiect a new one. Sammie Bethea was chosen by a unanimous vote. The enrollment of the school year of 1928 has already increased from 450 in September to 495 at the present date. New pupils are entering almost daily and there is little doubt but that Cherokee will soon have as many as last year. Many of the sections are completely filled now. Cherokee has already prepared a series of auditorium programs for the year, so we are assured of having some that are interesting, entertaining, and spicy. Good ones have already been put on by sections 9-1, 8-6, 7-1, and 9-6. The Girl's Glee Clud has also lent its aid, by presenting a one-act musical comedy. The fall season has been a very busy social time for the Cherokee students. Nearly every section has already engaged in some sort of social activity during the past seven weeks. Parties have been enjoyed by twelve sections, and there have been nearly an equal number of picnics. Olivia Park seems to have taken precedence over other places as a picnicking ground, and the Hallowe'en note has been dominant at the parties. The faculty have also had their share in social activities. Besides being privileged to act as sponsors at the student socials, they have had three distinct affairs of their own. Toward the end of September, Mr. and Mrs. G. S. Thompson entertained the Cherokee teachers at a picnic at Olivia Park. Miss DeLaney and Mr. and Mrs. Park were special guests at this time. The Cherokee faculty bridge club has held two meetings thus far. NEW RULING HOLDS STUDENTS IN CHECK. A new ruling, recently passed by the Board of Education, has resolved that students be excused from schools only on account of illness or for other serious matters. This ruling was passed pecause it has been increasingly noticed by the teaching force that the schools are endangered by the constant calls from different outside sources that students be excused from their classes. This, it was decided, is seriously damaging to the school system, in that interferes with systematic classroom procedure. The new ruleing purposes-to check these too frequent outside calls. Due to the absence of the coach the major sport for boys, which is soccer, has been delayed. However, every section has organized a team. A tournament is now being conducted. It is an elimination contest. The loosers will play all other loosers and the winners all other winners. New Rules Regulate Eligibility for Sports. Eligibility: all pupils earning a mark of C— or above in all regular four or five hour courses and Health shall be eligble to compete in the inter-class tournaments and inter-school contests. Ineligibility: Pupils falling below the standard set above shall remain in-eligible to compete in such contests for a period of six weeks following the declaration of such ineligibility. Mrs. Harrell, president of the P.T A., recently awarded section 9-I the prize for getting 100% of their parents to join the P.T.A. The prize was a wall flower vase. Billy Davis, President of 9-I recived in the behalf of the class. The entire school is glad to see Mrs. Meyer back again, after her illness of last week. A fish can swim in water because he holds his breath. A pirate is a free government where the people make their own laws. A smuggler is a government where the king rules. Before a person can become a resident of the United States, he first has to become civilized. Twenty states celebrated temperance day on October 31, carrying out the mandatory state law that the schools observe this subject. Mr. A. M. Meyer was the speaker at the Cherokee observance. He stated that temperance in a special phase of citizenship. The school is the big business of America. One million teachers and z8 million students are engaged in the schools. This means that one fourth of our population is engaged in teaching or learning. The aim of the schools is to teach students to be citizens and not subjects. To do this, they must master temperence. "The student who is unable to control his thinking or acting", he said, "is intemperate. Citizens who are temperate are builders rather than destroyers of character." "What to do with your nickle?" Buy two apples in the lunch room for two cents each. Then spend the other penny for a "Cher-O-Key." Gertrude Ginsberg left us last week to take up her residence in New York City. Journalism Club of Cherokee Junior High School. “Cher-O-Key (November 9, 1928).” RICHES of Central Florida accessed April 23, 2019, https://richesmi.cah.ucf.edu/omeka/items/show/978.